World of Warcraft Official Magazine "Ending Its Run"
Come September 30, the official World of Warcraft magazine will be closing its metaphorical doors. The mag, a joint creation of Blizzard Entertainment and Future Publishing, had seen a rough life. Launched in 2010, it struggled to find an audience, even among World of Warcraft's die-hard devotees, both as a result of its perceived high price and the publication's propensity for missing scheduled release dates. In total, the magazine only produced five issues. That said, it was almost universally agreed that the publication itself was of extremely high quality. Unfortunately, Future has decided to pull the plug. The publishing giant recently issued an email to subscribers informing them of their options. 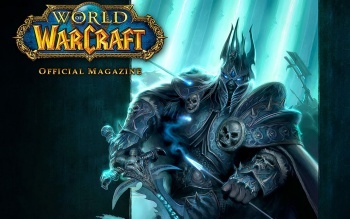 The World of Warcraft Official Magazine is ending its run, and the current issue, #5, will be the last one. This has been a difficult decision to come to. Although both Blizzard Entertainment and Future US are very proud of the magazines that we have created together, we have each decided to focus our efforts on other areas. We really appreciate your support for the magazine and would like to offer you a premium based on your remaining subscription term, or, if you prefer, a full refund of your remaining balance instead. Anyone still subscribed to the magazine can either request a refund of their money or put the funds toward other products such as a handful of World of Warcraft's in-game pets, a subscription to PC Gamer magazine or a plush doll with a $75 price tag. According to WoW Insider, those wishing to simply get their money back have to request a reimbursement in writing by September 30. Say what you will about the wisdom of launching a hyper-niche print publication in the era of blogs and LOLcats, but you can't fault the ambition behind this experiment. Sure it failed, but the idea that an online community might actually warrant an aesthetically gorgeous magazine devoted to their collective virtual existence was something that warranted exploration. If it can work for Cat Fancy, why not World of Warcraft?